Gov. 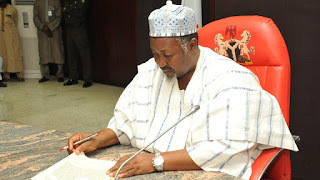 Mohammed Badaru of Jigawa, on Monday said the state government would distribute 47,544 goats to 15,848 women in June, 2019, under its Goat Breeding Microfinance Scheme. Badaru, who disclosed this to newsmen in Dutse, said the scheme was part of the State Livestock Interventions. According to him, 8,428 women received 25,284 goats under the scheme in 2018. He said that the programme was the most successful micro-credit scheme in the state, with 92 per cent retention and 79 per cent repayment level. On crop production, the governor said the newly-introduced reform by his administration had attracted huge investments in the subsector from multinationals. “Dangote Group is currently building a rice mill in Kaugama with the capacity to produce 280 tonnes of rice per annum, if completed. “Similarly, the Lee Group is investing in 12,000 hectares of sugarcane plantation to feed its 120,000 tonnes capacity sugar plant in the state. “This investment includes an associated production line of molasses, food seasoning, organic fertiliser and 15 megawatts of electricity generation,’’ Badaru said.